Sachin Kumar Pandey from Noida, B.E. - B.Tech Graduate. 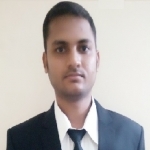 Sachin Kumar Pandey is Data Science Resercher and currently have no work experience. MACHINE LEARNING DEEP LEARNING JAVA PYTHON NATURAL LANGUAGE PRO..
are one of expert skill area's of Sachin Kumar Pandey . Sachin Kumar Pandey is working in IT Software industry.